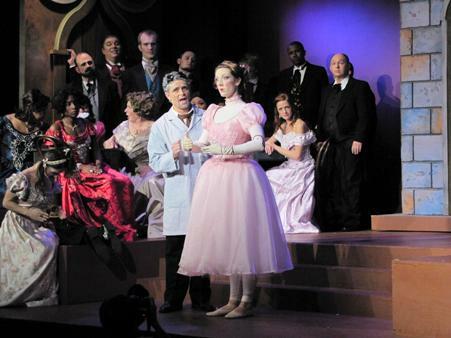 Opera in the Heights is opening its 15th season with what has to be a drug-induced series of dark fantasies, Offenbach’s melody-rich The Tales of Hoffmann. And for the first time in eleven seasons, the show is going on without artistic director William Weibel conducting the small but highly effective orchestra. As chairman Bill Haase explained to the packed house in Lambert Hall, which seems to look and sound better every time I attend an OH production here, the company is searching for a new artistic director. Several candidates, like Brian Runnels of the Gilbert & Sullivan Society of Houston, are taking up the baton this season. During his pre-opera remarks, I could almost sense Haase obstructing himself from references to American Idol. The feeling of audition is real, however. Making quick work of that part, Runnels acquits himself fine. Having never heard an OH opera without Weibel on the podium – and always thinking his work, especially as a conductor at performance, had to be a company strong suit – I was really listening on opening night. I wondered if there would be false starts, a blown note here or there. To the best a non-musician’s ears could tell, there was nothing of the sort. An artistic director needs to do more than conduct, of course. He or she must help choose repertoire, help shape the orchestra by hiring and firing, set and demand a pace from an ever-changing cadre of singers. Runnels is having as good a debut with Tales of Hoffmann’s frothy-yet-passionate tunesmanship as anyone could hope for. Another piece of the OH puzzle that keeps getting better is the overall production. Recent operas have simply seemed more complete, more satisfying, than some a few years back – which often had a feeling of perfectly fine musicians slumming it in a high-school gym. Changes in the Lambert Hall space (like the black behind the stage) and changes in the approach to set design (using the same type of suggestive minimalism so prevalent now, even with Houston Grand Opera) have liberated OH from being a second-class citizen. The stage area is still limiting, with too many steps for singers to stumble over, and they do, but the overall impact can be powerful. The Ruby Cast (there’s also an Emerald Cast, but I didn’t get to see them) is doing a great job of bringing Offenbach’s triangle of horror stories surrounded by a frame to life, in both singing and acting terms. Elizabeth Andrews Roberts is a dazzler as all three (or four, I suppose) women that Hoffman loves. She is particularly memorable as the mechanical doll Olympia – part of the same story line that fuels other Hoffmann-based creations, such as the ballets Coppelia and, stripped of all its dark shadows, The Nutcracker. She is wonderful too as Antonia, the young woman who essentially sings herself to death. Roberts is outfitted with two convincing singing actors in the Ruby Cast, emotive tenor John Rodger as Hoffmann and exquisite bass-baritone Benjamin LeClair as the demon who haunts all the protagonist’s efforts to win love. The latter’s tall, glaring, Mephistophelian presence makes a huge contribution to this production, and his rendition of the opera’s second-most famous set piece (after the “Barcarolle”), “Scintille, diamant,” is a showstopper. On their opening night, both male leads backed away from a few ringing high notes that have become part of Hoffmann’s live and recorded tradition, which is a shame. But as actors, they sell the story 100%. Beyond this central trio, the opera shows off several promising performances, many by OH regulars. These include Kenneth Alumbaugh as the quirky inventor Spalanzani (channeling a bit of Christopher Lloyd from Back to the Future) and George Williams as the mechanical Cochenille and later as the very funny, mostly deaf factotum Frantz. Heather Scanio does a superb job with what Offenbach gives her, the bizarre notion that Hoffmann’s apparently male buddy Nicklausse is also his poetry’s apparently female Muse. Unless we’re considering dark, drug-induced fantasies of our own, it’s probably best if we don’t go there. From Tchaikovsky to original electronic scores, and from Bourneville to Bollywood, the 16th annual Weekend of Texas Contemporary Dance celebrates the diversity and creativity of ten Texas-based choreographers and dance companies at Miller Outdoor Theatre Sept. 24-25. Dance Source Houston has presented this free dance festival here for the past 15 years. Executive Director Christina Giannelli and the Weekend curatorial team, Roxanne M. Claire, Joanna Friesen and Nancy Wozny, have curated an evening of mind-blowing entertainment. Tap dance, trapeze work and dancing with industrial fans are part of the evening performance at 8 p.m. The program includes: independent choreographers Paola Georgudis, Catalina Molnari and Leslie Scates. Featured companies are: Frame Dance Productions; infinite Movement Ever Evolving (iMEE); NobleMotion Dance; Reck Dance Projects; Revolve Dance Company; Suchu Dance; and Vault. For additional information about the dance festival visit www.houstondance.org. For ticket information for the evening program only, directions and location of Miller Outdoor Theatre visit www.milleroutdoortheatre.com or call (713) 373-3386. For dance updates, follow Dance Source Houston on Facebook. Dance Source Houston also presents Dance Around the World, a free family matinee, on Saturday, September 25, 2010 at 11 AM at Miller Outdoor Theatre. Dance Around the World explores the classical dance styles of two cultures. The top students from Houston’s foremost dance academies, Houston Ballet II and The Anjali Dance Company will present traditional and contemporary dances from the European and Indian traditions. Exciting dance, fabulous costumes and beautiful music will delight and entertain audiences of all ages. Additional Performances Sept. 11, 17 and 18 at 7:30 p.m., plus Sept. 12 and 19 at 2 p.m.
Houston’s ballet company, only months away from taking up residence in its impressive new downtown dance center, is opening its 2010-11 season this weekend with one of those open-ended, evocative titles artists think of so well: Body, Soul and Gershwin. Seen choreographically, the company kicks off a new year with two pieces by artistic director Stanton Welch and one by Jiri Kylian – for both gentlemen, pretty impressive company to keep. Though Houston Ballet has attracted some of its biggest headlines for world premieres of full-evening story ballets (such as Marie, as in Antoinette, which gets another outing this season), there are definite advantages to a mixed-rep program in terms of audience satisfaction. For one thing, it shows off more of the company’s always-impressive “depth chart.” For another, it does much the same for the diversity of its styles, from movement to music to costumes. Each of the pieces presented on opening night has been seen here before; none has ever looked better. Though “fun” might seem a shallow word for a ballet, Welch’s bright and mostly breezy Tu Tu wears the word on its sleeve. It features three couples, told apart not by storyline but by the color of their costumes – Gold, Blue and Red. Unlike Balanchine’s Jewels (coming from HB later this month), these colors aren’t particularly personified here; they seem merely ways of telling who’s dancing with whom. Nonetheless, the action is nonstop, all carried out on an empty stage marked by a changing box of white light that advances or contracts across the darkened floor. On opening night, top bravos from the audience went to company veteran Mireille Hassenboehler, who danced Blue with Peter Franc. This was only a subjective preference, though, since Nozomi Iijima and Connor Walsh were terrific as Gold, and Nao Kusisaki and Christopher Coomer were impressive as Red. The evening’s middle selection, by Czech-born dance great Kylian, offers that “something completely different” you keep hearing about. Somberly northern and almost violent at times, Forgotten Land replaces the depersonalized dance-for-dance’s-sake of Tu Tu with an ambiguous drama about the land, the sea and seemingly the darker side of human relationships. Again, people appear only as couples – including two pairings whose dark costumes seem smeared with red, as in blood – and there’s little to no smiling going on. Dance, especially modern ballet like this, at its best defies strict representation. It evokes, instead, strong emotions that don’t exactly know where to fit. With its incredibly bold and sometimes thunderous score by Benjamin Britten, who apparently stepped over from Houston Grand Opera, Forgotten Land makes us think and feel – without making us think or feel any certain thing. All six couples are ominous and angular, sweeping and turning across blank space before a dark-clouded projection that perfectly matches the timpani-thunder in Britten’s score. Again, Hassenboehler drew some of the biggest ovations, dancing what must be the piece’s scariest pas de deux with Jun Shuang Huang. Kelly Myernick was amazing with Walsh, as was Melody Herrera with Ian Casady. If ballet often seems 90 percent technical prowess, once in a while it seems at least 70 percent acting, or at least characterization. This, of course, is a matter of the choreography itself, which points us to Welch’s finale of fireworks set to George Gershwin’s Concerto in F. Far less known (meaning less hummed) than the American composer’s Rhapsody in Blue or An American in Paris, the concerto does nonetheless serve up some of his finest melodies in the early 20th-century classical-jazz vein that was his life’s work. The Core: Gershwin the Heart of the Big Apple presents us with the colorful flora and fauna of New York, virtually all showing the swagger for which the city is known. Lucky for Welch, swagger workers well on dancers in general, and Houston Ballet’s dancers in particular. So many of the company’s best dancers are also excellent actors that we can only look forward to many story ballets from Welch in the years to come. With the same street-wise spirit of big-budget NYC musicals like On the Town, The Core shimmered with its huge cast of characters – featuring names as tongue-in-cheek as Stanley and Stella, Three Sailors, USO Girls and even Two Broads. We got a particular kick (no, not from champagne) out of Connor Walsh as JR and Amy Fote as Velma. Photos by Amitava Sarkar: (top) Houston Ballet artists in TuTu; (middle) Mireille Hassenboehler and Jun Shuang Huang in Forgotten Land; (bottom) Katharine Precourt and Houston Ballet artists in The Core.